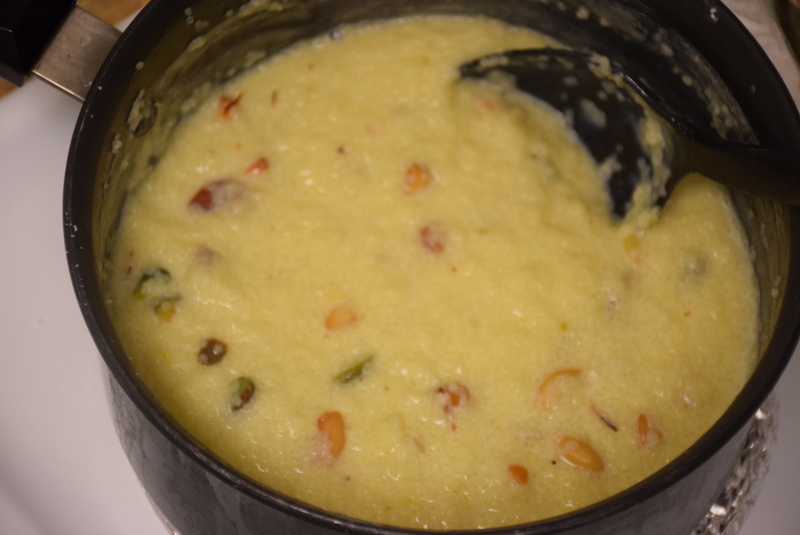 Shamak ke chawal/ Mata ke Chawal /Samo seeds are prepared in the form of porridge/khichdi or pulao with vegetables or even this sweet delicacy like pudding . It tastes heavenly and I prepare it even in regular routine now. This recipe is special because it gets ready in minutes and is so lip-smacking that you just can’t avoid having it till it gets finished. 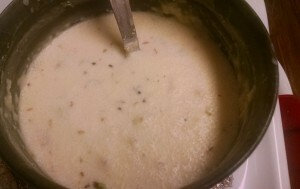 Again this recipe is inherited from my mom’s recipes. Actually it is a millet which is grown in soil where rice and other grains cannot flourish. The story behind its cultivation according to mythological reasoning is that, once upon a time there was a famine near Vaishno Devi. So starving devotees prayed Goddess Durga for help and she gave them these Samo / Mario seeds as a boon. Since then ,they got famous as Mata ke chawal and are had during navratri or during any fast abstaining cereals in it. 1. Wash the rice by rinsing it slowly on your hands once. Then soak it for 15 mins. ALternately you may skip the soaking of seeds and start with the next step directly. 2. 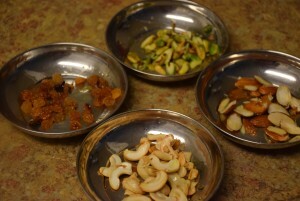 Shallow fry the nuts you prefer to use in desi ghee(Clairfied Butter) and keep them aside. 3. 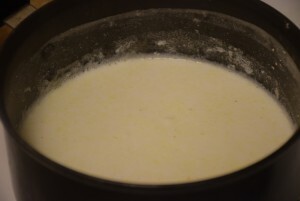 Now add milk to a pan and bring it to a boil .Make sure the pan is heavy-bottomed. 4. When it starts boiling add the samo seeds to it and stir well. 5. 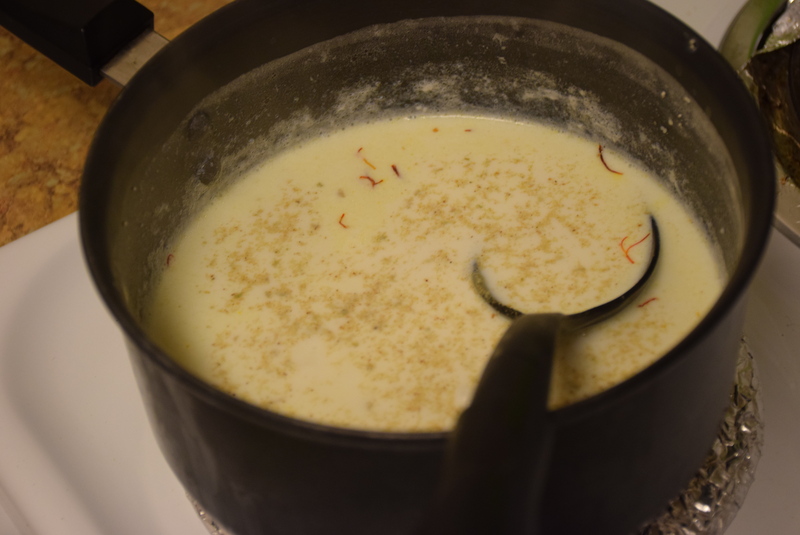 Lower the heat and add the saffron strands in it and continue stirring in between. 6. 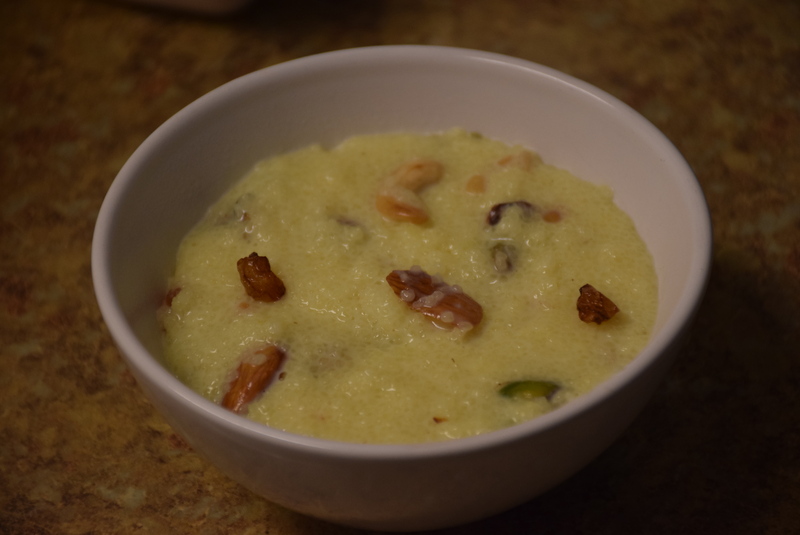 When you see the milk level has fallen half the initial level and see a layer of fat cream or malai has started floating in it , then add the dry-fruits already roasted. Also you will note a significant change in color of the milk ,when it has cooked. 7. Serve it hot or refrigerate it and eat it cool. You may garnish it with more chopped nuts if you like. 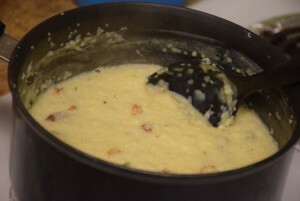 I like the consistency to be thick somewhat of the shrikhand so I have added lesser milk. 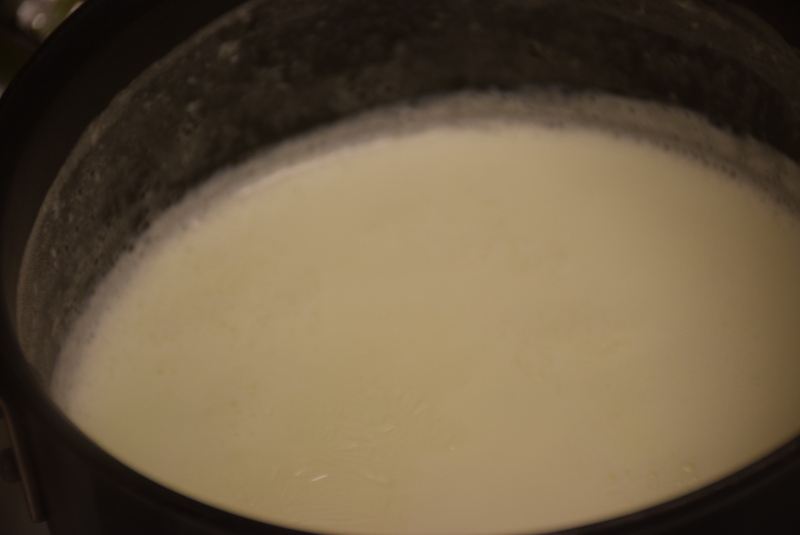 Since it tends to absorb milk on cooling , so stop cooking once you reach the right conistency. 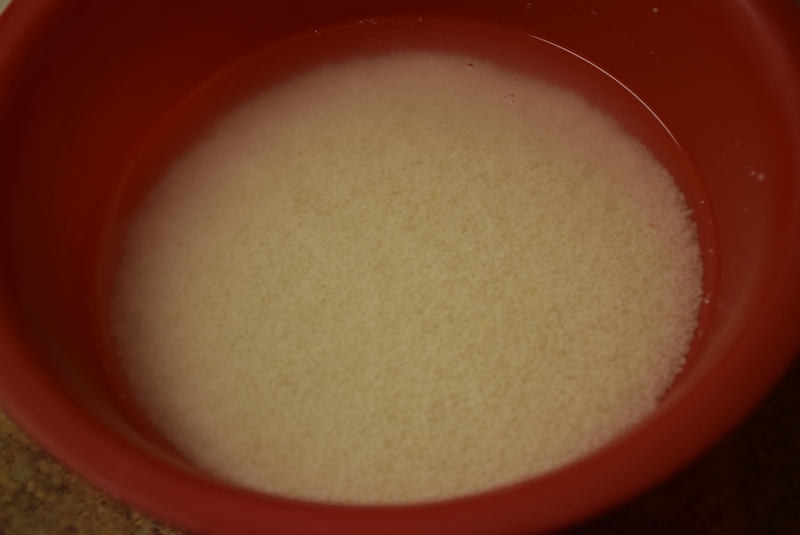 If at any time you feel the pudding has dried up a lot or is very thick ,then add more milk to it and bring it to a boil again. This is the beauty of this healthy ,digestible recipe. This entry was posted in Food, Recipes, Vrat Recipes and tagged 10-minute recipe, bhagar, chawal, Echinochloa frumentacea, fasting, Goddess Durga, holy, mario, mata, moraiaya, MOrio, navrati, Navratrein, recipe, rice substitute, Samo, seeds, shamak, shyamak.